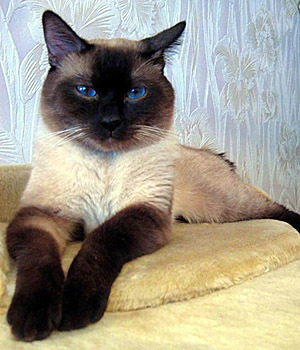 Over the past couple of decades, western breeders turned the “original” Siamese into some sort of “designer cat” with distorted head and body features. I was quite disturbed with these developments, and was distressed that I might not be able to find a “real” (original) Siamese, when it was time for the next one to share my space. Thus, I salute the “Thai” breed, that attempts to preserve the original Siamese cat appearance. I have two Thai-Cat/Old Style Siamese cats. They are both wonderful friends of mine, and get along tremendously with each other. I adopted a pair of sisters, siblings from the same litter, in June 2011. One them succumbed to a stroke during 2010, which left her permanently disabled. The vet at the emergency hospital urged me to have her put to sleep. I complied, of course. The breeder was able to let me have a female Thai-cat/ long-hair Siamese cat mix. She was born last August and is remarkably calm, affectionate, and easy to get with feline. My senior cat has an equally wonderful, dialed-back and affectionate disposition and she accepted the newcomer within a few weeks. I considered my senior cat (named Mei Noi) talkative. However, the kitten – now ten months old – is extraordinarily talkative. I have named her Mali, which means Jasmine in Thai. Mei Noi is talkative too, but is virtually mute compared to Mali.